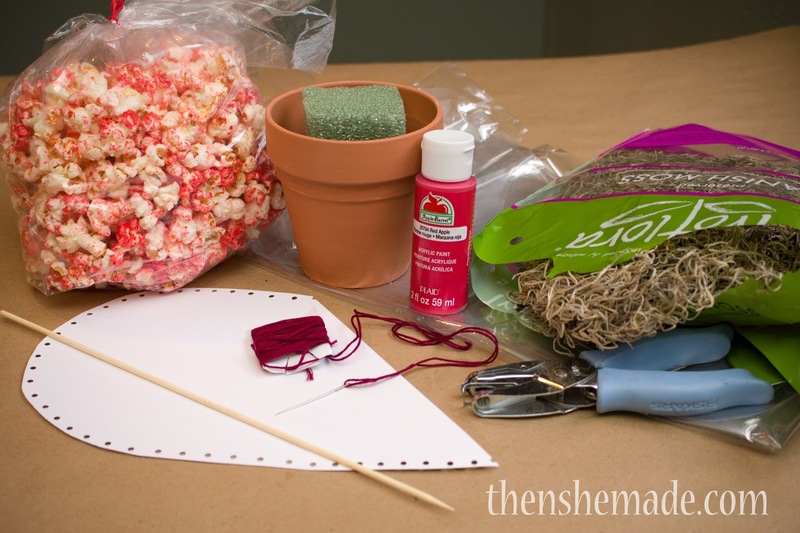 Who's up for a quick Valentine craft? As you know I kinda have an obsession with popcorn lately. I mean, I posted in December twice about gift ideas using popcorn I picked up from my favorite local kettle corn company. 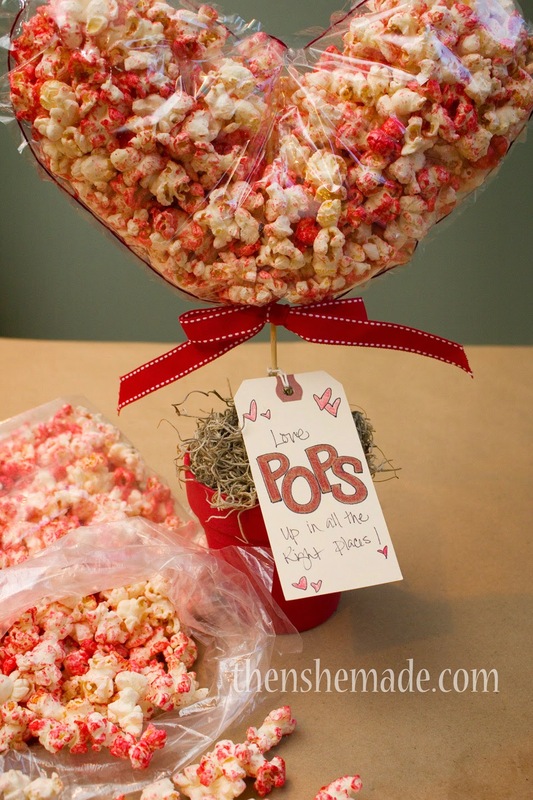 So it's only fitting that I carry on the popcorn craft tradition and show you what you can do with it for Valentine's day, too. Right?! Luckily enough for me, a week ago or so we were up in Old Town square and I brought home a new flavor of kettle corn (new flavor for me anyway) - Cinnamon. It's yummy! And, it's perfect for Valentine's day because it's red and white. 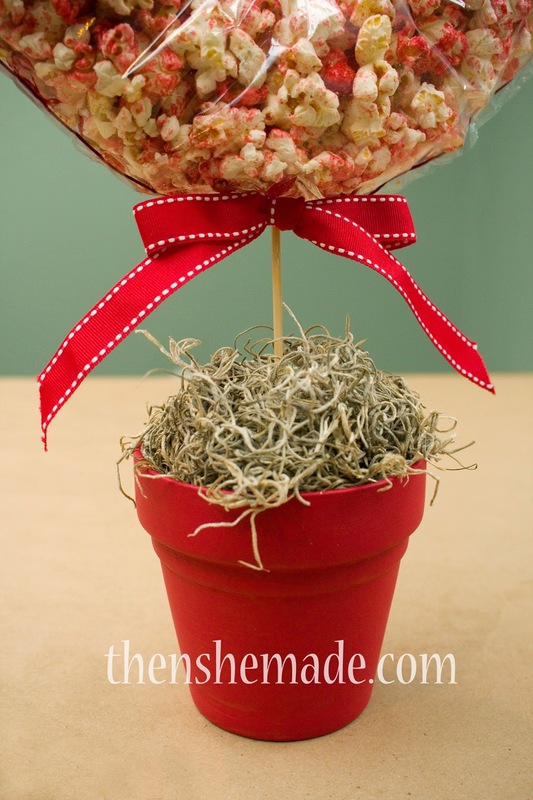 Before my kiddos ate it all, I snagged some and here's what I made with it - a fun little Heart Shaped Popcorn Topiary. Want to make one? 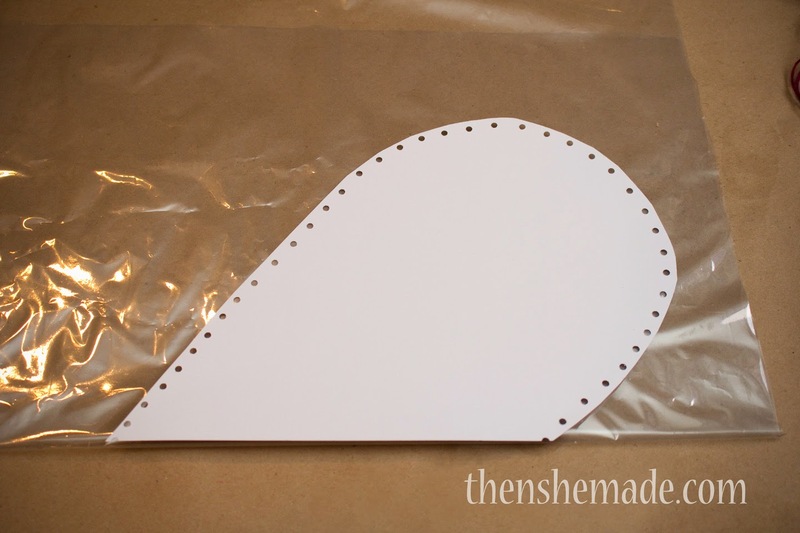 Step 2: Next, cut a half of a heart out of your card stock to make a pattern. Then, fold your cellophane in half and place your heart on the fold. Cut out two hearts from cellophane so that you have a front and a back. Be sure that you DON'T cut the straight edge of the pattern. This is the fold and you want to be able to unfold your cellophane after you cut it out to have a full heart. Step 3: Using your hole punch, punch small holes all along the outer edge of your cellophane. Step 4: Then, thread a needle with floss and quickly stitch your cellophane pieces together. I just used a simple running stitch and stitched almost all the way around the heart. You don't want to stitch it all the way closed just yet as you need to leave an opening to add in the popcorn. 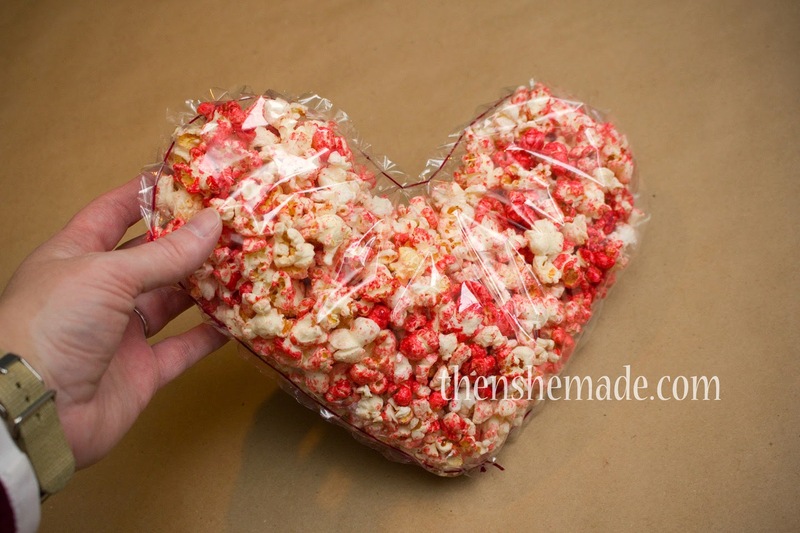 Step 5: Carefully add your popcorn into the heart. Once it is full, finish stitching the heart closed and tie a knot in your floss to fully close the heart up. Look how cute, it's like a little heart shaped popcorn pillow! Step 6: Next, using your bbq stick, skewer your gumdrop and slide it down about a third of the way on the stick. Step 7: Carefully thread your stick into the bottom of the cellophane heart and press up until heart rests on gum drop. 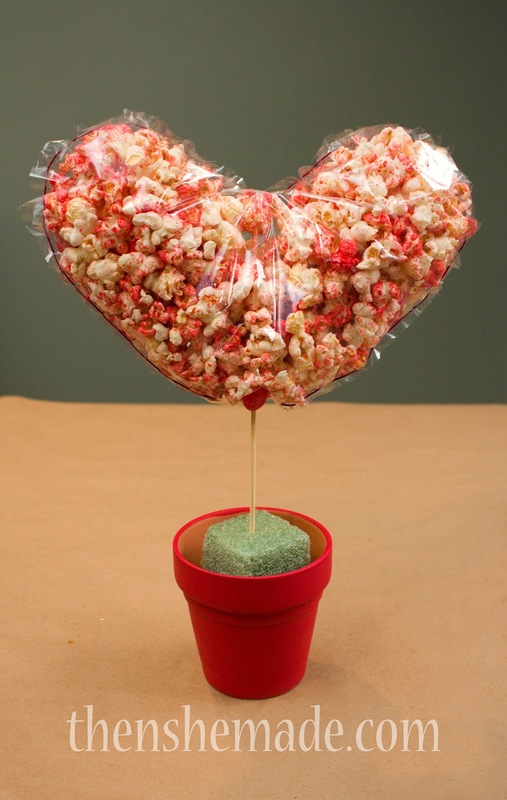 TIP: if the stick starts to go through the top of the heart, carefully put your stick through a piece of popcorn. This will act as a stopper and will keep the stick inside the heart. Step 8: Take some cute Valentine themed ribbon and tie a simple bow over top of the gumdrop but at the bottom of the heart. 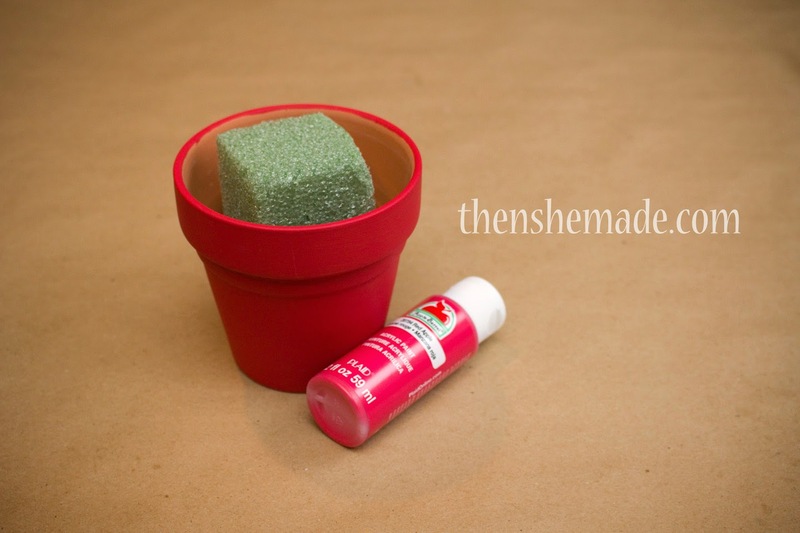 Then add on your floral moss to cover the top of the pot and the floral foam. "Love POPS up in all the right places!" Because, well, isn't that true? If you let it, love and kindness really do pop up when you need them most and usually at the right time and place. P.S. - This is not a sponsored post. I know I've posted about popcorn a lot lately but I don't have featured/sponsored posts on my blog so my obsession with A-maize'n Kettle corn is my own opinion. Trust me, if you've had this stuff you'd be obsessed too. 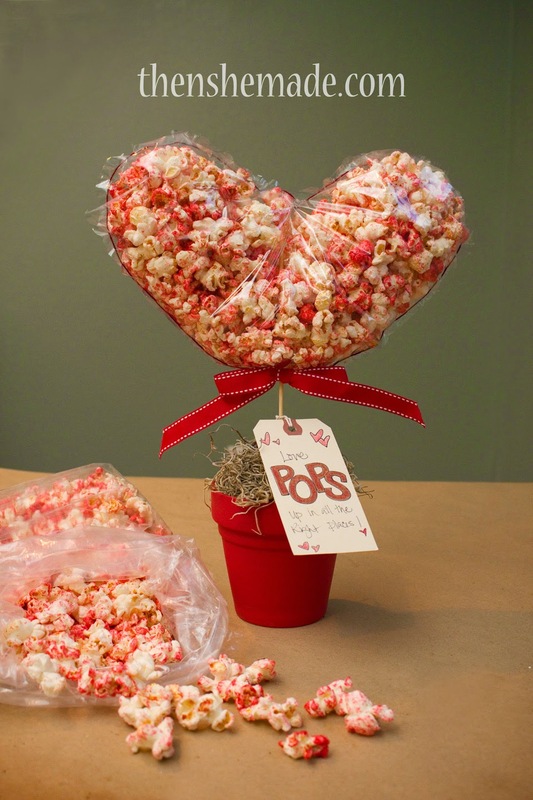 P.S.S - If you don't want to make a heart shaped topiary, popcorn would still be a fun food valentine to give. Just stick it in a bag, decorate with hearts on the outside and use a fun little saying like "Valentine, so glad you popped into my life". Or "Valentine, you make my heart pop!" See, I'm just popping up with all kinds of good ideas! Happy February to you all - more Valentine crafts to come! TOTALLY BRILLIANT~~ and very simple to follow instructions! Valentine WINNER!! What a great idea, I love it! I included this to my Valentine’s Day blog post as well as one of my favorite Valentine’s gift idea. Thanks for the post! What a cute idea! I like cinnamon, too!